VertaseFLI was employed to undertake various works on this challenging former industrial site. The primary works involved addressing significant growths of Japanese Knotweed present across the site. In addition to this, VertaseFLI undertook earthworks in order to create an appropriate development platform ready for the importation of clean capping material. 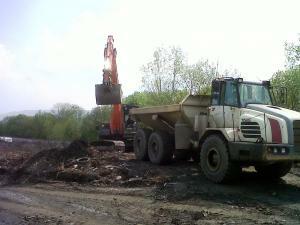 Prior to these works, it was necessary to complete vegetation clearance works across the site. In order to generate this development platform, it was necessary to import a significant volume of soils onto site. VertaseFLI sourced a local brownfield site generating excess soils and operating under the CL:AIRE Definition of Waste Code of Practice, imported these soils onto site. VertaseFLI was asked to design an appropriate remedial methodology for Japanese Knotweed to allow redevelopment, ensuring a sustainable and cost effective approach. An options appraisal identified that a deep burial containment cell was the most appropriate and cost effective solution. In consultation with the client’s engineer, an appropriate location was established and a deep cell was excavated and lined with MDPE. Following excavation, rhizomes were segregated from infested soils. This small volume (by weight) was exported to a suitably licensed landfill. 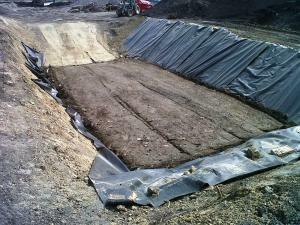 The soils were then placed and compacted within a lined containment cell. Upon completion the cell was sealed by MDPE thus completely enveloping the infested soils. The location and depth of the containment cell was accurately surveyed and clean soils were reinstated over the cell to new formation levels. All works were undertaken in accordance with Environment Agency guidelines and to the satisfaction of the client, client's supervising engineer and the regulators. Strict housekeeping was adhered to at all times to prevent cross contamination. Cross boundary infestation not available for excavation is being subjected to ongoing monitoring and spraying.